Promotional graphic for Off Track designed by Rebecca Comtois. BOTTOM LINE: An absurd, heartfelt murder mystery that will draw you in and keep you guessing, even after you leave the theater. It's winter in Chicago and the transit workers' union is threatening to go on strike, leaving thousands of people stranded wherever they end up when the trains stop running. For most people this means working from home for the foreseeable future, but it means something very different for Ian (Matthew Trumbull), a journalist who just so happens to cover the transportation beat for his publication. After using an inside source to follow the negotiations, Ian becomes one of the few people to know that the strike is coming before it actually hits. However, that doesn't stop him from getting stuck in the wrong part of town after a one-night stand and a mysterious murder send him on a wild goose chase far away from his usual jurisdiction. 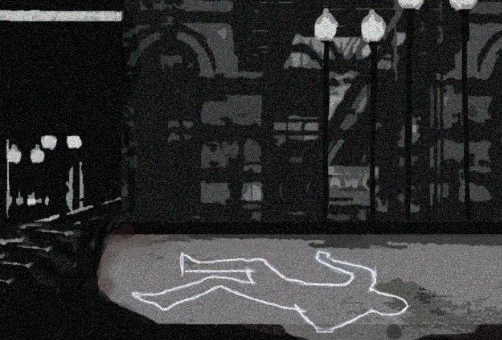 Off Track is a true murder mystery, complete with suspects, red herrings, questionable leads, and incompetent police who show up to inform the "detective" about the case and then seemingly disappear for the rest of the story while our protagonist does all the legwork. It plays off of a lot of noir tropes, and provides a few laughs along the way as characters subvert genre expectations. The quiet, inscrutable detective is here an awkward, bumbling news reporter—Ian, played with tremendous presence and comedic timing by Trumbull—and the usual band of thugs and lowlifes that you would expect all seem a little more absurd when they become various drunk and/or high patrons of gay bars and clubs throughout the city. All of these jumbled characteristics make Off Track funny and unpredictable, and create an interesting ride of under 90 minutes. The comedy and intrigue are only ever stifled by occasional moments where the sudden, unexpected kindness of strangers is immediately followed by conversations that were perhaps attempting to communicate the moral of the story, but not quite getting it across. But these scenes also add to the feeling of confusion and moral ambiguity that Ian has to grapple with, which is almost more satisfying. I walked out vaguely aware that there was something I was supposed to learn from this cautionary tale, but also baffled as to what it was. One of the greatest challenges of Fringe is designing a set that can load in and out in a short amount of time, so designers have to be both creative and practical when fulfilling the needs of any show in the festival. This production's use of sound (designed by Patrick Shearer) and projections (by Philip Emeott) were enjoyable, and went a long way towards creating environments that would otherwise only have been hinted at by the sparse set pieces on the stage. This is definitely a story meant for mature audiences, so if you have children, or are a stickler for political correctness, you may be pretty uncomfortable sitting through some parts of the play. But Off Track is definitely worth seeing if you're at all interested in a contemporary twist on one of the oldest kinds of stories. You'll laugh, you'll gasp, and you might even be able to guess "whodunnit." Off Track is by James Comtois. Directed by Tim Errikson. Set Design is by Sandy Yaklin. Lighting Design is by Morgan Zipf-Meister. Projections are by Philip Emeott. Sound Design is by Patrick Shearer. Graphic Design & Props are by Rebecca Comtois. Costume Design is by Ariel Pellman. Fight Choreographer is Michael Eisenstein. Stage Manager is Patrick St. John. The cast is Timothy Babcock, Yeauxlanda Kay, Anthony F. Lalor, Synge Maher, Tomike Ogugua, Timothy McCown Reynolds, Michael Sciortino, Matthew Trumbull, and Christopher Yustin.